The seas get cooler around Iceland-Some charts and anecdotes | Watts Up With That? (translated from Swedish) from an eyewitness report from the Swedish icebreaker tour to The North Pole in 2018. In this area of the ocean the temperature drops (cut from Google Earth. The green dots show where it is active Argo measuring buoys ). 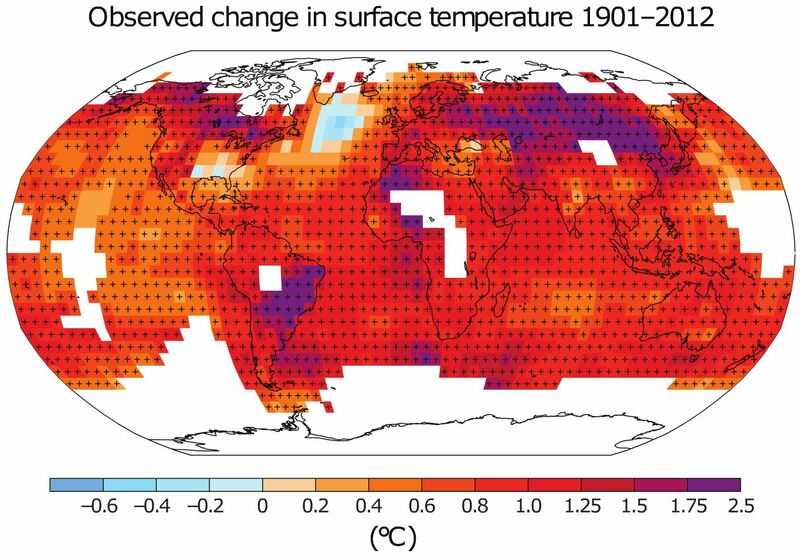 Evolution of ocean temperature in the range 100 m to 1900 m below the surface. This is consistent with observations that show that the sea ice slowly has begun to increase in extent and volume again. The cyclic variation of temperature in the north has apparently given us the beginning of an expected temperature drop. “… .. It is important for this research expedition that we come as far north as possible so as to measure on the masses of air that originate from the pack ice to the greatest possible extent. Other research projects are constantly ongoing such as ice cores, CTD, weather balloons. The ice that is about 90-100% concentrated, is thick and compact, this in my highest non-scientific perspective as a navigator, but I have been up here before and not seen these conditions since 2005. Life in the ship floats on without problems. The animal life is sparse. Additional comments should be unnecessary. Water Temperature-graphs are produced using the ” Global Argo Marine Atlas “. Link to the letter from Oden. As usual, said with no evidence. And it just isn’t true. Here is the GISS map which clearly shows the cool spot, as in the top fig here. There are papers about it, eg North Atlantic cooling trend. Even RealClimate has written about it. yes, but these ARGO floats are clearly defective. They probably have calibration dirft. Please cal Josh Willis a.s.a.p. , he will quickly identify the individual floats causing the problem, delete them from the database and restore the warming we all know is there. The first graph is of SST anomalies vs a 1951 to 1980 baseline and the RC link shows a cool spot of up to -0.6C. Over Iceland? There is a big white area – that is -0.2 to + 0.2 (the middle band) just south of Iceland. If anything, Iceland (as shown in that first graph) is bright orange, which would be 1.0 to 2.0 deg C. There is no cooling shown in the Iceland area – none. The “cool spot” you see is over the North Pacific, the Bering Sea. That’s a bit different than Iceland. There is NO cooling trend shown in any of Nick’s links for the Iceland/North Atlantic area. None. And the two graphs in the article show a definite drop in temperature in the 2000s. No, Iceland is not ocean – over the “cold spot” to the south, which is what this post is about. I didn’t say there was (over Iceland) – again we are talking (this article, Nick, me) about the ” cold spot” in the N Atlantic. There most certainly is as the 1901-1912 baseline anomaly that the RC graph shows as linked by Nick. Is there or is there not is a 3rd shade of blue on that graph (S of Iceland), which is up to -0.6C? Unless colour blind, the answer is yes. So there is cooling since that baseline. The “definite drop” in the 2000’s is PART of the anomaly from the 1901-1912 baseline. Nick’s GISS link shows some of this area being -0.2 to +0.2…but over half is +0.2 to +0.5, +0.5 to +1.0, and +1.0 to +2.0. Clearly ARGO contradicts that. Stop being absurd. Allow me to stick my foot in the door here and wonder aloud if the temperatures around Iceland are effected by the amount of sea-ice flushed south through Fram Strait. This should be a good time to study that, as there was less-than-normal last winter and more-than-normal this winter. I also wonder if we are witnessing some part of the roughly sixty-year oscillation of the AMO. ..what’s this “as usual” bullcrap? What does this orange and red mean? 2003 is before the charts above start, you need something later. No, it isn’t. It is for just one day – 20 June 2014. 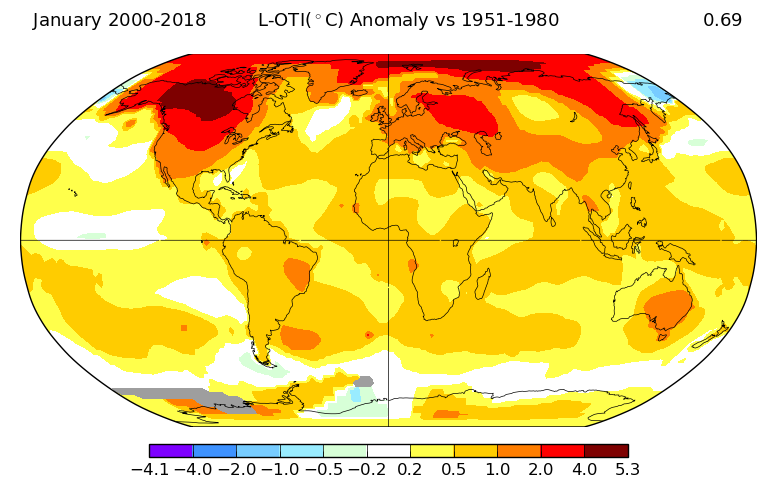 “that is the exact same area they have been showing as a warm anomaly since 2000”. The longitude and latitude are correct for Icelandic seas. Unless this is from Bizzarro world. Which is where Kleyemat Sceance id from. The smarter climate hustlers like Hansen and now G Schmidt at GISS knew they had about a 35-year window, from 1979-1980to about 2012-2016, to use increasing CO2 as a causal excuse for the coming warming. An approximate natural 35 year warming end from internal climate cycles was the only way to explain the 1910-1945 warm “blip”. So too they expected a coming 35 years of warming to run a scam based on dubious causality. The supercomputer modellers climbed on-board the building gravy train of climate funding. From a science ethics point, it has been downhill ever since. Or more to the better analogy, down the rabbit hole climate science went to a place where everyone could lie to each other and everyone could increase their funding. Now it’s 2019, and except for a fortuitous big El Nino in 2015=2016, the party is over. The music has stopped. But the climate liars down that rabbit hole will be the last to admit it. Meanwhile everyone else in reality (like those poor souls in central Canada and northern US in the coming days of early March) will be wondering “what the hell happened to global warming” for the next 15 or so years? Do you think they thought we could actually reduce CO2 emissions? Related question: Does anyone know what happened to DMI’s Greenland Surface Mass Budget web page? It went dark a few weeks ago. Could be the data were becoming too inconvenient. Thank you! The new site has much detail. +10, was wondering about that myself. If only w could plug the hole that they’ve climbed into and keep them sequestered away from the real world. The Gulf Stream behavior looks to be very complex. Hypothesis: If the Gulf Stream is slowing slightly (not shown here) and the temperature of this water is cooling, could it be that less heat is using this route to go from the equator to the Arctic? This then could lead one to believe that heat is bottling up further south, masking Global Cooling, and artificially (or naturally!) making the earth look warmer. This could snap back and bite us in the yingyang during a Dalton Minimum. I judge that the cause is more cloudiness from more wavy jet stream tracks reducing solar energy into the oceans. Should see a similar pattern around Antarctica. More cloudiness? Svensmark & Marsh? The Gulf Stream flow is set up in the tropical region via solar heating and the Trade Winds, and including the local warming of the Gulf of Mexico. Earth’s rotation and North America and the contours of the ocean basin help define this flow. Second, as stated in my comment at 7:38 pm, the location being looked at in this post is well past the Gulf Stream’s major contribution of warmth to the Ocean. Mostly, at this latitude, it is long since gone. Is it possible (measurements of this anywhere?) that there is more northerly flow through the Bering Straights, which would require simultaneous southerly flow elsewhere, during the last two decades or so? Then the Arctic would net warm as Pacific ocean water flows into the Arctic, and the seas south of Greenland would cool as Arctic water flows south into the Atlantic. Just speculating and wondering if anyone can answer this question with data. In the NRL animated sea-ice thickness map you can see the sea-ice pushed north from the Bering Sea north through the Bering Strait for the last month or so, and at the same time the sea-ice come south on the far side of the Pole, against the north coast of Svalbard and also flushed through Fram Strait and down the east coast of Greenland. So I’d say the answer is that there can be a Pacific-to-Atlantic flow…sometimes…. But just a year ago there was an atypical flow the “wrong way”, slowing and even reversing the flow south through Fram Straight. The ice was actually pushed north, away from the north coast of Greenland, and Alarmists raised the usual hubbub about there being open water there, where the sea-ice is usually piled up. But this was a polynya caused by wind; it was far too cold for melting to occur. The currents of cold water coming south can’t really cool the waters south of Iceland, because they are denser than the warmer water and sink down deep. But the actual ice atop the water doesn’t sink, and it can have a major cooling effect on surface waters. I’ been watching the North Atlantic cooling slowly for over 10 years past. Although the isothermal pattern is very different year to year one can see a slow, steady drift of the average position southward. Someone with more resources than me should look at the records and prepare a paper on it. The region is somewhat past the Gulf Stream. Some call it the North Atlantic Drift (or Current) at these high latitudes. The land in the upper left of that image is the Island of Newfoundland. So does this mean the warming isn’t hiding in the ocean around Iceland? For 30 years we have spent countless billions studying man-made climate change, under the assumption that nearly all changes in climate are man-made. This assumption is completely unfounded, as historical climate studies have shown a great deal of climate variability with constant levels of atmospheric CO2. One of the obvious natural cycles is the AMO (Atlantic Multidecadal Oscillation). The AMO has far reaching climate impacts, and certainly combines with other natural climate cycles to help create natural climate change. For most of the satellite era, the AMO has been in it’s warm phase, but it has been cooling for a decade and may be entering its cool phase currently. If it is, we will likely see Arctic sea ice making a gradual comeback over the next 15-20 years. We will see harsher winters in the US and Europe. We will see a little drop in the Atlantic Tropical Cyclone activity. Frosts and freezes will become more costly for agriculture in the US and Europe. And we might see another prolonged ‘pause’ in global warming, or even some global cooling, depending on how the AMO interacts with other natural cycles. This winter has been unusual for people who are only in their 30s, but for those of us with twice as many trips around the sun, this winter is just a reminder of the winters of our youth, and the obvious natural cycles that have a far greater impact on the Earth’s climate than us pitiful humans. The winter certainly has been unusual — earlier this week it was over 20 degrees C in the Uk for two consective days making them the hottest winter days every recorded in the UK. While in the southern hemisphere it was the warmest summer on record in NZ. Not to mention the constant heatwave in Australia driving temperatures way above average. With growing UHI i’m surprised it hasn’t reached 25 degrees. It is really very easy to find and interpret historic Australian heat wave data. I have done this for the 6 main capitals a where there are long records and most of the national population. For these dies, there is no justification for the official ptpoaganda claims that heat waves are becoming longer, hotter and more frequent. Simply, they are not. Look it up on earlier Jo Nova blogs under my name. average (1961 to 1990). Which was exceptionally warm since the previous record was only 1.4 degrees above the average. Urban heat is on the rise, I wonder why? Percy the anomalous atmospheric heat waves in Australia and NZ has been caused by ‘blocking’ high pressure in the Tasman Sea, which has been created by a meandering jet stream. 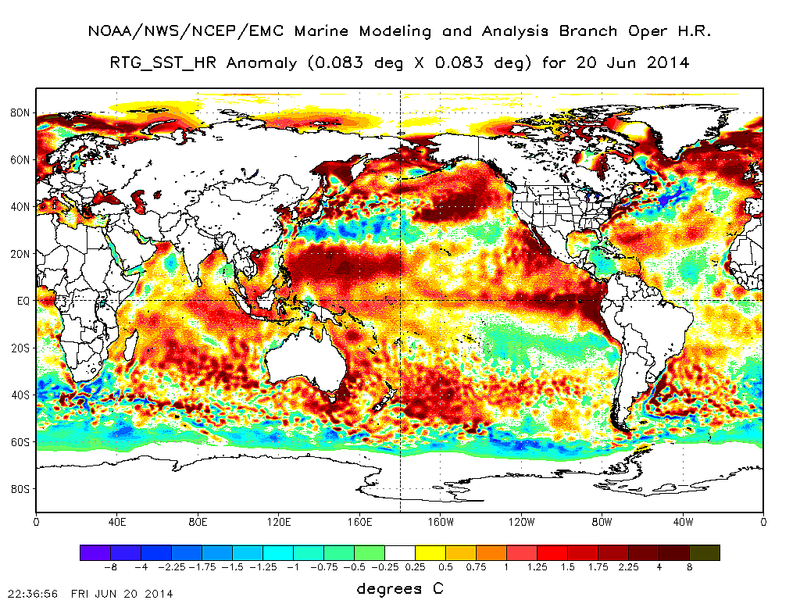 You will also be aware that the Tasman Sea is unusually warm because of the blocking high. Coupled with the loss of intensity in the subtropical ridge, these anomalies are directly linked to global cooling. “Look it up on earlier Jo Nova blogs under my name. “Then please stop the unscientific, uncritical acts of yours that parrot unfounded propaganda for purposes that you ought to be ashamed of”. Even were that true … just a statement of fact with no personal comment from Percy. Are there Blog rules that say so? Classic naysayer overturning of common sense and logic. As you and most others on here certainly do “parrot unfounded propaganda for purposes that you ought to be ashamed of”. That is unless the likes of Nick, Percy and a tiny few who come on here to point out facts this place is a riot of confirmation bias and echoes, hugs and kisses over supposed science – that the scientific world has got wrong by reasons of incompetence or fraud? Do you want this place to be a 100% echo chamber? I know Charles doesn’t at least, as he’s asked me to contribute a piece here . … which I turned down precisely because of comments such as yours. But well done at least in being polite. I suggest you take a look at all the work done on the problems with the Australian BOM data, to note just a few. Past cut off at 1910, thus excluding the heat waves of the 1800s. Adjustments to the data cooling the past with the introduction of ACORN1 dataset. Even more Adjustments to the data cooling the past with the introduction of ACORN2 dataset. Weather stations with Curtailed low temperature readings. Weather station algorithms that do not meet the international and WMO standards for duration of readings, thus recording “spikes”. AC – how dare you question the climate clergy using evidence and reason?! You shall be shunned. Look, these people like Percy are religious. Dogmatic faithful. This isn’t a personal attack, just an accurate appraisal. I’m sure they are decent humans in real life but they have become modern day Anabaptists. We keep engaging with zealots somehow imagining reason will prevail? We are wasting our efforts. Read what I wrote about heat waves. Then, if you can, argue the official observations that I show. Finally, again if you can, relate the observations to any possible CO2 connection. What induces you to blog what you did if you haven’t studied the observational data? Lemming? So you won’t “contribute a piece” here because of comments you’re afraid to receive…but you have no problem contributing post after post and receiving such comments. You really don’t like making sense, do you? No kidding, record snow for February in MN. Only 1 or 2 days that were slightly above the average temperature with the rest of the days easily 10 degrees lower. It was -4 F yesterday on my drive to work. You realize Australia is a VERY BIG place, right? Summer is hot, water is wet, snowflakes over-react, bears s**t in the woods. Aust is arguably the hottest place on earth, nut the hot conditions this Summer were geographically limited, not general or everywhere, NE Aust and SW Aust were both cool for most of the summer, which is entirely typical for years dominated by blocking highs and trade wind flows … which … yes … also creates southern state heat waves..
As for NZ a large warm anomaly appeared in recent months around NZ … after a long and bitterly cold, snowy Winter of 2018.
re NZ. Four decades farming here in the same location lead me to conclude that I must have a magic bubble enclosing my farm. “warmest summer on record in N Z”- cough- that is simply laughable. Tomatoes and cucurbits insist that it was cool, not so dry as it can be, and hay making was problematic. Sorry , just not credible. Now three weeks from the Autumn Equinox , and it is cool earlier than many years. OK, I’ll bite…..What the heck is “cucurbits ” ? And here in Iowa we’re having some one of the snowiest and coldest starts to a year since the early 1980s. (There’s that ~35 year thing again.) Several days coming up with up to 30F below normal highs, likely setting several ALL TIME RECORDS. Percy Jackson…what I am talking about is natural climate variations and weather. What you are talking about is also natural climate variations and weather. What I see is patterns that have occurred in the past, producing weather that has also occurred in the past in a very similar way. You, apparently have no real knowledge of past weather or natural climate variations, so it makes sense that you would see everything happening as something new, different and even frightening! The late Climatologist Prof. William Gray identified this problem with the proponents of global warming way back in the 1990s. He equated them with barbarians, because neither group had any ‘history’. To this day, the warmists, ignore the history of the Earth’s climate, or, in the case of Michael Mann, create an alternate history that is not contradictory to their pet theory (at least for a brief 1,000 years). Every day we are subjected to headlines that scream that the signs of man-made climate change are happening all around us, and that anyone denying that is either delusional or evil. Yet these ‘signs’ are identical to weather that happened in the past without man-made global warming, and occurred just as frequently as they are happening now. In climate science, the barbarians have stormed the gates and taken over the realm. Welcome to the Dark Ages of climate science. Hottest by tiny amounts that previous measurements might not have captured and due entirely to weather. And records happen, unless you think that in the last 100-150 years the UK has had every possible “natural” temperature? I thought that maybe I was the only one that remembered the winters in the 60’s and 70’s in the US plains. I can remember my father pulling a big 10 man bobsled made out of a car frame around our little town on many nights. Going fast down through ditches that had drifted was always fun! The third figure in the text is an important one. It shows the evolution of ocean temperatures in the range 100 m to 1900 m below the surface. An important role in the ice melt of the last decades has been played by the inflow of warmer than normal subsurface Atlantic water. My guess: subsurface water deeper than 100 m. After some time this water has been able to warm and destabilize the upper ocean layers, resulting in an enhanced melt of summer ice and late freezing. Having its atmospheric consequences (more water vapor, more Low Pressure areas). If it is the cooling subsurface water from the area shown in figure 1 that is flowing under the surface water west of Nova Zembla (what I suppose it is) and that will start / already started (?) its round trip along the coast of northern Russia eastwards to finally end up (after a decade or so) north of the Canadian coast, then a trend of stabilizing upper surface waters and consequent cooling (on a somewhat higher temperature level perhaps) is what we can expect for the coming decade/decades. Resulting in a stabilizing / growing ice sheet over the Arctic. I would disagree with that statement, as it seems to be another case of the tail wagging the dog. WR: So do I. It is the content of the paper that is interesting. The content of the paper shows that it is the subsurface Atlantic Ocean that was causing the original (!) sea ice loss. This resulted in atmospheric changes etc. Scientists are ‘obliged’ to follow the alarmistic meme: that is what we read in the first sentence of the Abstract. I consider the content of the paper of high realistic value. Forget the ‘fund-raising’ remarks. Unfortunately present science needs to use ‘popular sentences’ like the one you quoted. Yes, I also found the paper to be quite revealing and appreciate you drawing attention to it. There was actually some good science in the article. I have always been curious about the phenomenon of warmer water laying beneath cooler water, because the warmer water is more salty. The “lens” of colder, fresher water is bound to become unstable, as it cools and becomes more salty. Originally the freshwater lens is created by the input from huge rivers like the Lena, as well as the melting of surface ice which is relatively salt-free. Near shore where the shelf water can be ice-free it can be warm, but once it moves out among the bergs it has to sink to the freezing point. As it cools I imagine some salt gets added due to mixing, until it must arrive at a sort of “tipping point”, where a more normal situation (with cold water sinking below warm water) is reached. Then “overturning” of the water might occur. I wonder if a similar phenomenon could have occurred in the low-ice season of 2012. The surface lens was cooled to the “tipping point” by the fact the sun was sinking and surface air temperatures in August can dip below freezing, and then that big gale of August 2012 supplied the “trigger” for the “overturning”. I was amazed by how swiftly a large amount of sea-ice vanished. It made no sense (to me), as the air wasn’t that warm, and it was cloudy, and the gale should have caused evaporative cooling of any exposed water. (I actually was so suspicious I suspected fudged figures, until I had an email exchange with a scientist who was up there, and he said the ice really had vanished.) I then thought warmer, sub-surface water had to have been churned up. But what bothered me was that waves only “churn” downwards so far, as submarine commanders know.) They especially can’t churn far down when (at the start) the water is ice-covered. Now a little light bulb has gone off in my head, and I’m toying with the idea of “overturning.” Thanks again for the link. Also, it seems I should do just what Geoff is doing above – type my reply in Word then post it to this site, so as not to have to retype everything again. MAybe I am reading too much into this but there seems to be a very specific change roughly at the start of 2013 on these figures. It would be interesting to look for anything that could correlate to that. Might start digging through that time frame to see if there was anything that could have caused this. It will stop me getting bored during my new status of retirement. But humanity will waste $10 trillion before anyone bothers to acknowledge that. Okay but how good are the detrended numbers on a cycle that long with unequal data going back that far? Go with not detrended in this case with irregular and long cycles. Okay, perhaps you should do your homework by yourself? Or just wait, it´s cooling right now. I have lived long enough, seen and feeled one whole cycle with AMO. And here in Iowa we’re having one of the snowiest and coldest starts to a year since the early 1980s. (There’s that ~35 year thing again.) Several days coming up with up to 30F below normal highs, likely setting several ALL TIME RECORDS. I’m not sure, but I think the point may be that we’ve been authoritively told for more than 30 years that the world is warming such that snow and ice would substantively diminish. Some admonished that by now snow would disappear completely and the Arctic would be ice-free. In spite of these dire warnings, Iowa is having one of its snowiest and coldest winter starts. Oh man I hope the helicopter is named Thor. The stadium wave continues its 70-90 year trip around the planet. Increasing ice conditions starting now from Iceland to Siberia were forecast by Judith Curry in 2013. Let’s not forget there are a few climatologists that include nature in their analysis. This is pseudo-scientific myth-making. The “stadium wave” is a gimmicky name given to a widely manifest ~60yr temperature oscillation of uncertain origin, whose fundamental physical properties as a progressive wave (phase speed, amplitude and direction) have never been established by Wyatt and Curry. If anything, the progression shown by cross-spectrum analysis is slowly westward from eastern Siberia, but never reaching Iceland as a coherent wave. The relatively stationary AMO dominates multidecadal oscillations in the N. Atlantic. The warming is hiding in a jar on Gavin Schmidt’s porch. Better get used to it…. The AMO is turn over and against the warmist excuses with unrelenting, long-term cycle moves. Turning points and long run cycles rule! Googled “Why is it so cold?” Top hits were from JAN 2018….but what about 2019?? The Arctic ice is starting to come back. When it gets closer to maximum cyclical levels the winters will make this one look gentle. We are at the equivalent of about 1940 cyclically. Uh… well, if you add ice to the water, it cools down, so this means there’s MORE warming… right? I just gave a talk last week at the Bolin Centre for Climate Research, Stockholm, about the “warming hole” in this area. I’m part of the working group which co-organized the Oden expedition but have not been involved in the cruise myself. More like a cooling stack…..